It may or may not shock you to know I am not the biggest fan of the cannoli. Not the traditional way anyway. I am not a huge ricotta fan and sweetening it, doesn't feel any better to my taste buds! HOWEVER, my husband IS and I wanted to make a little cheater version, simply because making homemade shells just wasn't in my days plan. I think these turned out really good AND furthermore, I think they would be perfect for a party! You have the sweet cream right inside an edible bowl. Perfection. No dirty dishes for this girl! Now don't ask why because I can't explain but I would NOT use a mixer, hand held or a stand mixer to mix the ricotta cheese. I don't know why, but when you just use a spoon, it doesn't become as thin. We don't want cannoli sauce here. When you use a mixer it changes things. So please, just use a spoon or else, I can't guarantee you will be happy with the outcome. Although even if it is a bit thin you ARE putting it into a pie crust bowl! Right? Enjoy these and make sure to only fill as many as you will need, and don't fill until just before serving! Combine all ingredients until smooth, refrigerate until ready to serve. Pie Crust (I used premade or you can find my fab pie crust recipe here. Combine sugar and cinnamon until mixed and set aside. Remove your pie crust and roll out. Using a small glass or cookie cutter, cut out circles that are big enough to set down into mini muffin cups! I would say a 2-3 inch in diameter cutter or glass will work. One pie crust yielded 24 mini cups for me, so you will need 2 pie crusts to make an entire batch. If you only want 24, half the ricotta mixture recipe. Preheat your oven to 425 F. Spray your mini muffin tins with nonstick spray. Taking your cinnamon sugar mixture, sprinkle your pie crust circles liberally and then take your circle push it down into one of your mini muffin cups careful not to stretch it a lot. Just put it in and push it down, so you form a cup. Repeat with all of your circles. Bake for 10 minutes and then let sit until cooled. Remove cups carefully and fill with your ricotta cream using a spoon or pastry bag and sprinkle the top with mini chocolate chips. These should not be filled until just before they are ready to be served! If you fill your pastry bag it will make much quicker work of it and you can keep it cool before filling. Just my 2 cents! 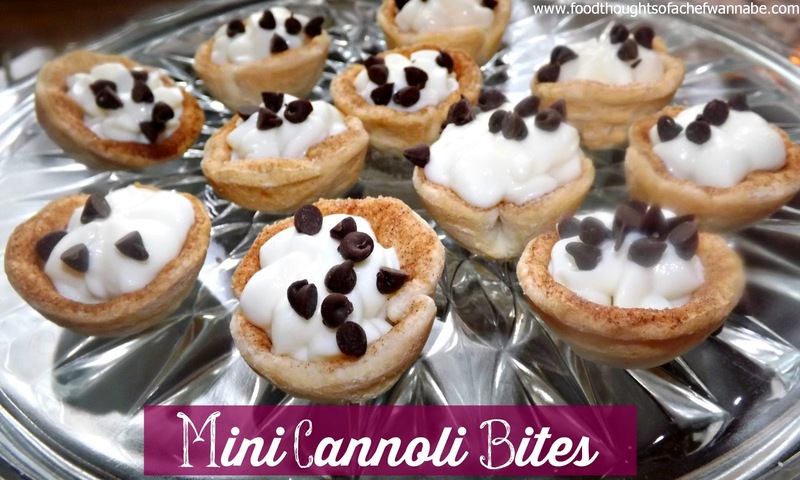 If you love cannoli, you will love these little bites of pure bliss! !